A web browser is the application which allows the user to gain acces and explore the content of the internet. It can view text, images, video, audio files, etc... It allows you to visit different websites by typing the web address in the address bar at the top. there are different kinds of browsers. some of the more common types are: Internet Explorer, Mozilla Firefox, Safari, Opera, Netscape Navigator, and the new Google Chrome. You can install more than one browser at the same time in your computer. 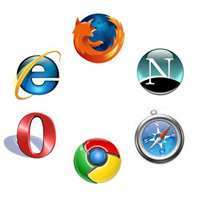 today's browsers have more advanced functionallities that makes surfing the web easier. For example: they have search engine toolbars, so instead of going to google.com, or yahoo.com and search for something, you can install their toolbar to the browser and search directly from it. other functionalities are pop up blocking, spell checking, and advertisement filtering.